A quaint corner of France can be found in London’s Smithfield. When it comes to Pascal Aussignac’s, fine-dining restaurant, exceptional quality, creativity and the best of South-West French cuisine should come to mind. 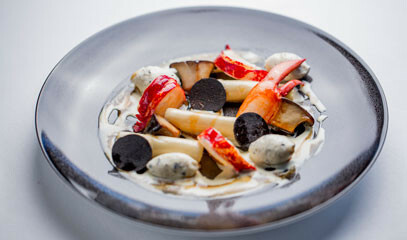 Aussignac’s inventive dishes have earned him a Michelin star and Taste of London’s “Best in Taste” award three times. It’s 20 years now since lauded chef, Pascal Aussignac, opened his premises in Smithfield, London, next to the gatehouse entrance to St Bartholomew's priory church. The premises, once a Lyons Corner House, have recently been under renovation. The result? A stripped back, subtle marble finish, and greater space to spread the original number of tables which still retains its intimacy. Chef Pascal Aussignac pays tribute to his native South West French cuisine. Hailing from Toulouse, his Gascony roots are evident in the dishes dreamt up for each delicious menu. Aussignac's culinary skills were sharpened alongside some of France's master chefs, such as Gerard Vie, Alain Dutournier and Guy Savoy. Club Gascon opened in 1998 to much praise and was awarded its first Michelin star shortly afterwards, in 2002. This experience is available for dinner Monday to Saturday, 6pm to 9.30pm. Please note that this experience is not available during December and on Valentine's Day. Service charge (13.5%) is not included; this is left to the guest’s discretion on the day. The menu is subject to seasonal change and availability. Please state any dietary requirements at the time of booking. 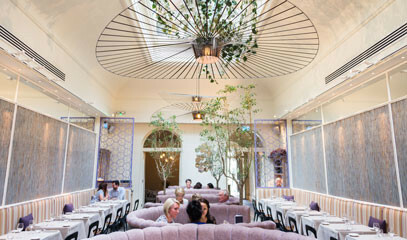 The restaurant can cater for vegetarians and pescetarians. Cancellation: At least 48 hours’ notice is required for any cancellations or amendments to bookings. All bookings are subject to availability. We recommend booking at least 2 weeks in advance to guarantee the desired date and time.